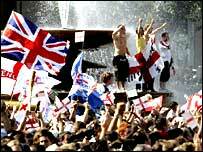 England's cricketers were given a rapturous reception in Trafalgar Square at the end of the Ashes victory parade to celebrate their win over Australia. Captain Michael Vaughan thanked the "fantastic" thronging crowd and admitted: "This is beyond a dream." The team later enjoyed a Downing Street reception and went to Lord's to hand over the Ashes urn for safe-keeping. England beat Australia in a series for the first time since 1987 after drawing the final Test at The Oval on Monday. England's women's team were also part of the parade, following their own Ashes triumph in August. "It's been a long night," said Vaughan, who clasped the replica Ashes urn throughout the celebrations. "We've celebrated in true English fashion and this is incredible. "This is fantastic, thank you for the support, not just today but all through the season. "The team have been magnificent, the management have been magnificent and these people (the fans) have been even better. "We believed at the beginning of the summer we could win. We went 1-0 down, there were challenges set upon us and the guys responded fantastically well." Opener Marcus Trescothick conceded it would take time for their achievements to sink in and admitted the sight of England's 2003 Rugby World Cup winners celebrating in London acted as an incentive. "I remember in Sri Lanka watching the Rugby World Cup final with Michael Vaughan and Ashley Giles," Trescothick revealed. "It was great and, when we saw their street celebrations, we felt we wanted a piece of that. That has helped drive us." The tens of thousands gathered in Trafalgar Square cheered highlights of the exhilarating summer series and interviews with each member of the victorious squad before a rendition of 'Jerusalem' rounded the presentation off. The ceremony followed a 90-minute open-topped parade from Mansion House during which the two buses crawled through thousands of flag-waving fans as crowds built up in a sun-drenched Trafalgar Square. 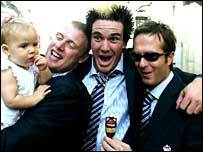 Vaughan and player of the series Andrew Flintoff soaked up the atmosphere at the front of the bus with their young daughters as office workers leant out of windows along the route to catch a glimpse of the team. Australian-raised wicketkeeper Geraint Jones held up a giant inflatable Dalek emblazoned with the words "Aussies exterminated". And Kevin Pietersen, man of the match in the final Test at The Oval, repeatedly sprayed those on the street below with champagne. "These are amazing scenes and it's fantastic what is happening to English cricket," Pietersen told BBC Sport. "I'm taking it all in and this is great for the game of cricket." After a heavy night of celebrating, Flintoff admitted to BBC Sport: "Getting up this morning was a bit of a chore but I'm enjoying it. "The people of London have turned out for us and it shows how much cricket and the Ashes mean to them. It's fantastic." Reflecting on the momentous victory and the reaction of the public, Vaughan told BBC Sport: "This has been an awesome series - not just the standard of play but the spirit in which the game has been played. There has been an overwhelming level of sportsmanship in this Test series. "We play it hard but if you play it fair as well it's a great game. "The most amazing moment today was seeing the sheer volumes of people greeting us, but it was also good to meet the Prime Minister. "He didn't give us any wine to start with but he eventually had to crack some open from his fridge! I know Freddie Flintoff wasn't too happy initially." England battled back after losing the first Test to win the series 2-1 after a tense draw at The Oval. Following the celebrations in Trafalgar Square the squad were guests of honour at a 10 Downing Street garden reception before heading to Lord's, where they presented the Ashes urn to the MCC for safe-keeping.